LET US CONTINUE FOCUS OUR ATTENTION ON THE ESSENTIALS OF OUR FAITH. TAKE SOME TIME IN PRAYER ASKING THAT YOUR FAITH BE STRENGTHENED. STATIONS OF THE CROSS DURING LENT: FRIDAY EVENINGS IN THE CHURCH BEGINNING AT 6:30PM - MARCH 22, 29, APRIL 5 AND 12. AS DONE IN THE PAST, SOUPL WILL BE SERVED BEFORE STATIONS OF THE CROSS ON FRIDAY EVENINGS FROM 5:45-6:15. 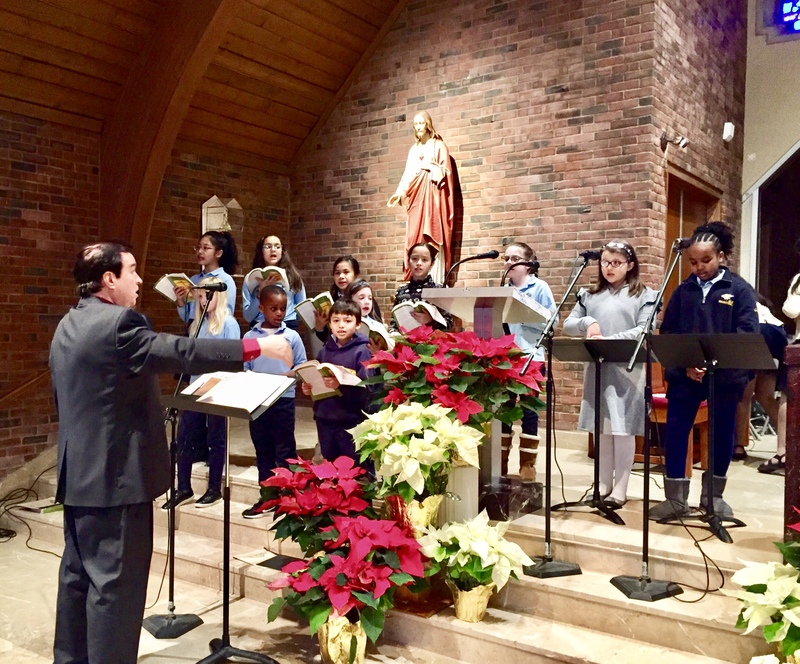 Last Sunday, Our Lady’s Academy kicked of Catholic Schools week at the 9:00am Mass. 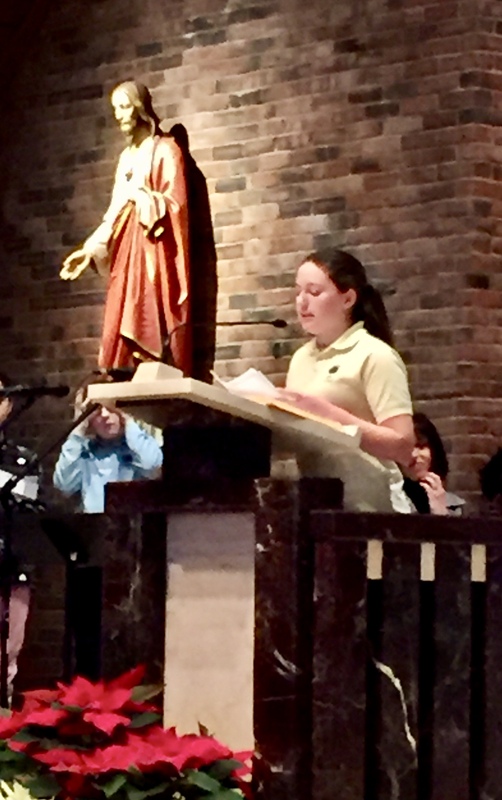 Principal, Mrs. Minor spoke briefly after current student, Ava Palazzolo spoke about our school. 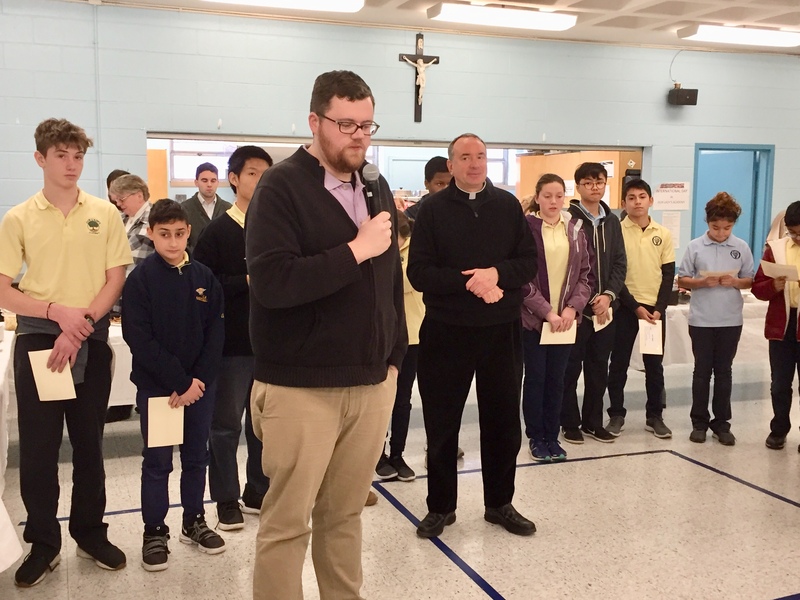 High School and 8th Grade Altar Servers joined Fr. 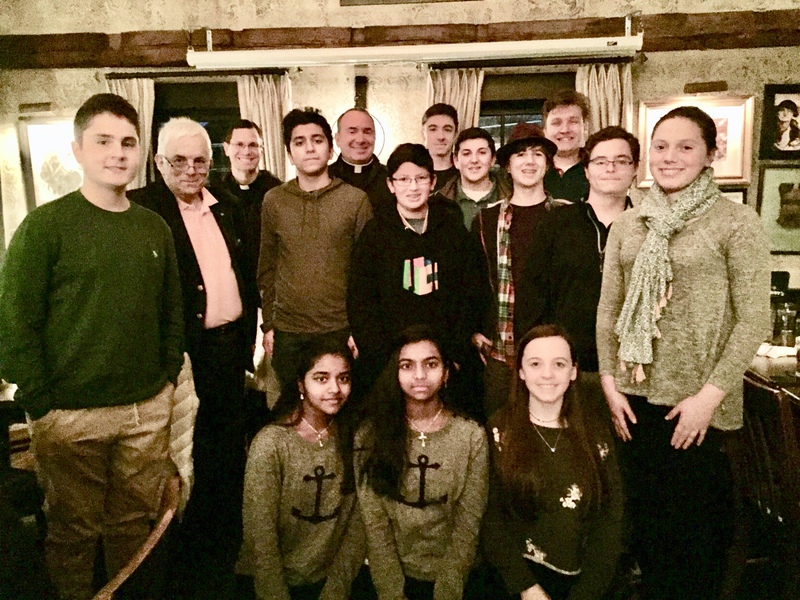 DiPerri and altar server coordinator, Paul Loscocco, at Paddy’s Restaurant in West Newton for dinner on Friday January 25 in gratitude for their faithful service. Grateful to O’Hara family, owners of Paddy’s for providing the meal. 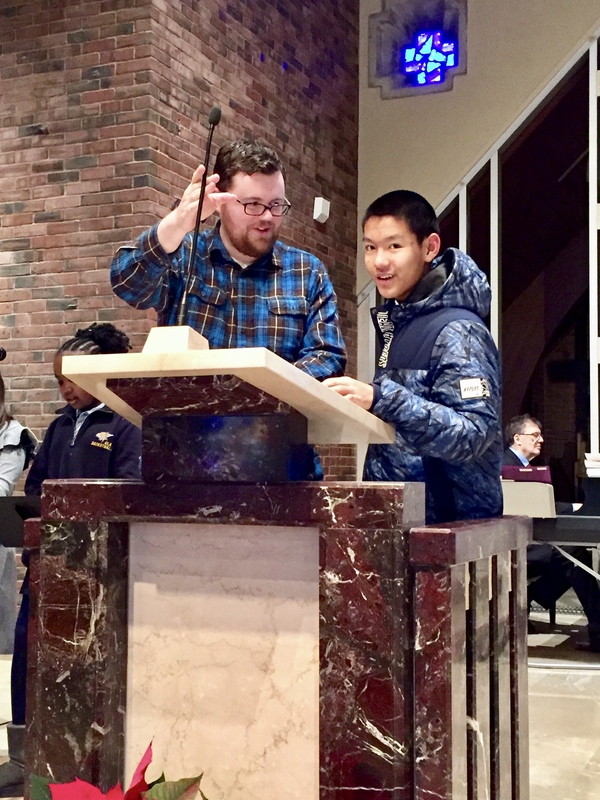 Join Seminarian Joe Hubbard on Tuesday, January 22 beginning at 6:00pm in St. Joseph Chapel in the school. Please enter the building through the main entrance where the Holy Family statue is located. January 22, 2019 marks the 46th anniversary of the Supreme Court decision in Roe v. Wade. We invite you to come and pray for the unborn and for an end to abortion. 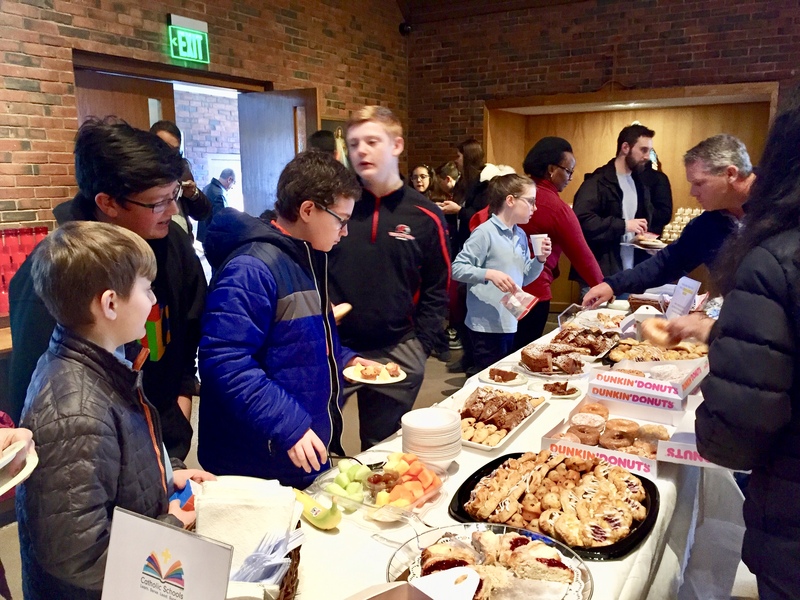 Mass was celebrated by Cardinal Seán O'Malley for Boston pilgrims at the Respect for Life March in Washington, DC on January 18. 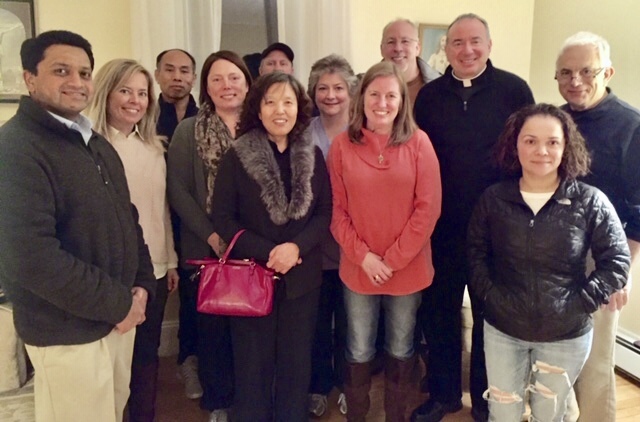 Pictured below is the delegation from Our Lady's Academy and their families. Let us continue to pray for the unborn and for an end to abortion. 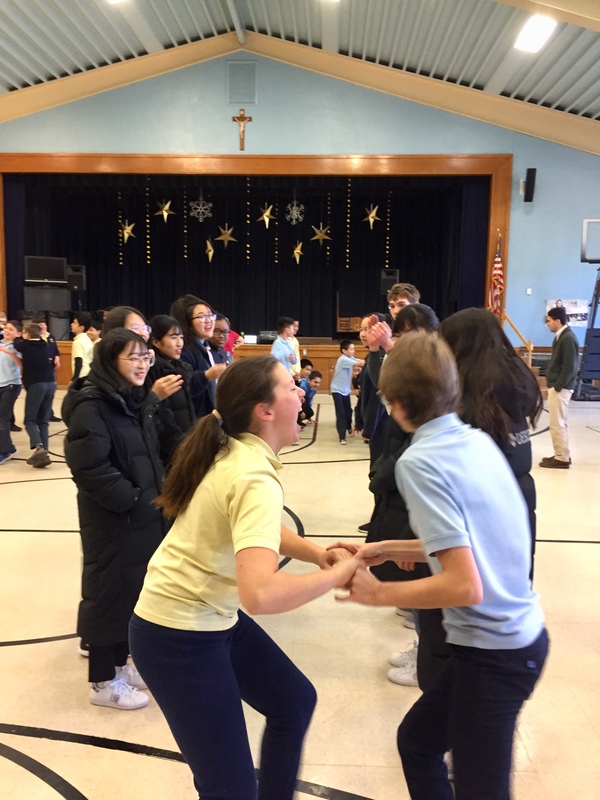 On Monday, January 14, our parish school, Our Lady's Academy, hosted an "Internation Day." 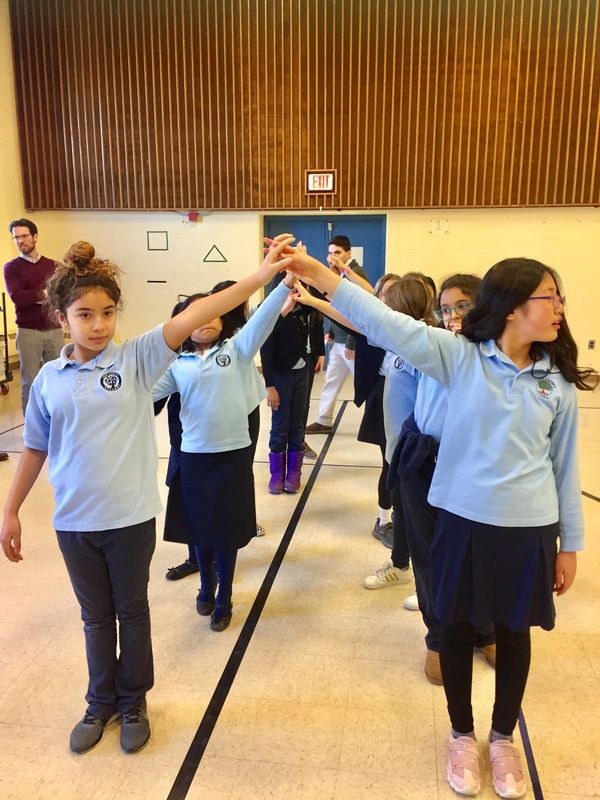 The event was wonderfully organized by parishioner, Lou Alvarez, cominging the link between parish and school. 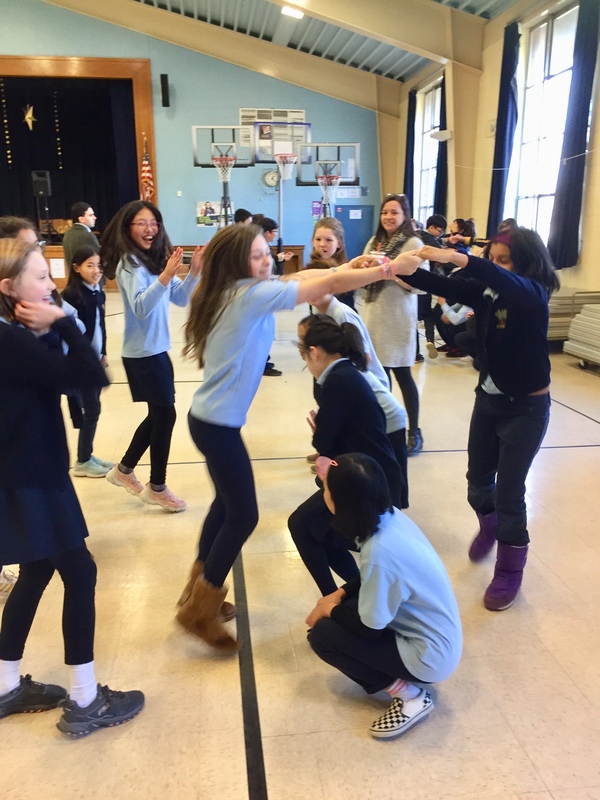 The day celebrated the many cultures and ethnic backgrounds that give Our Lady's Academy its global atmosphere. 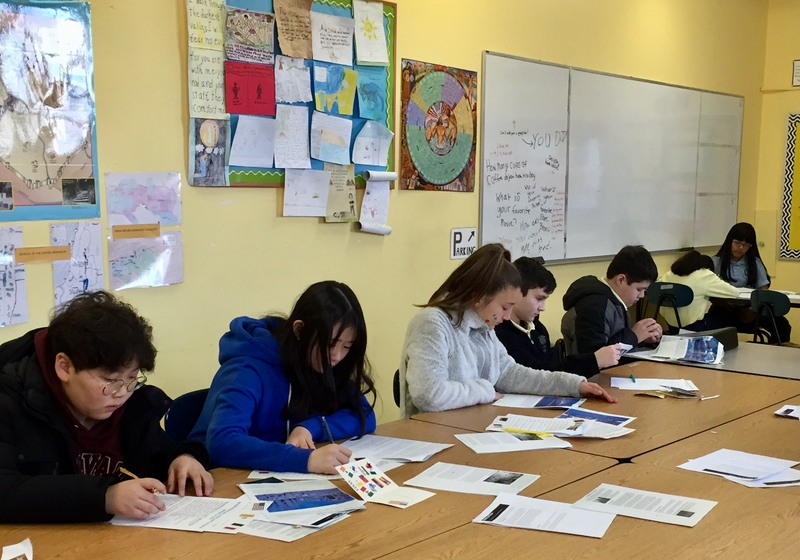 During the morning, the students visited classrooms representing each country. 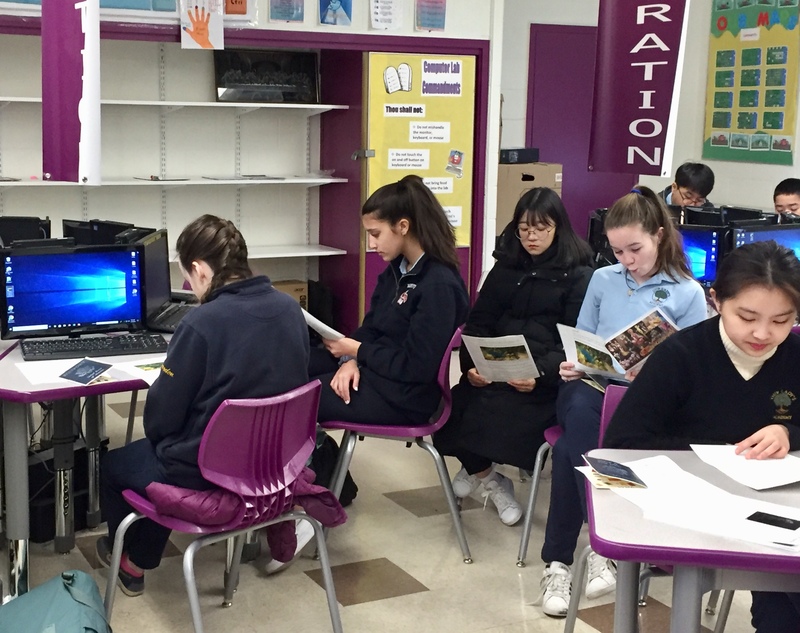 They viewed videos and read articles about the history and culture of each particular country. 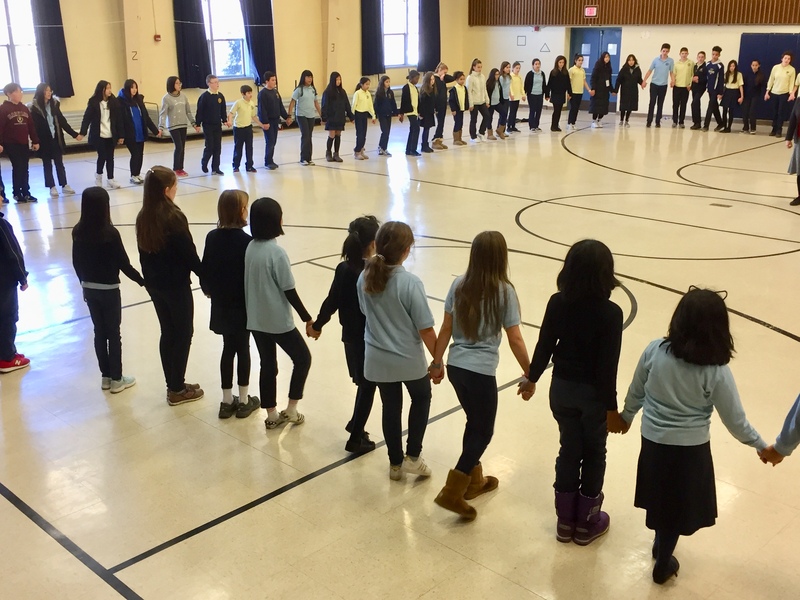 Before lunch, the children prayed a decade of the rosary in ten different languages. Mr. Giles said a prayer and our pastor, Fr. DiPerri blessed everyone. 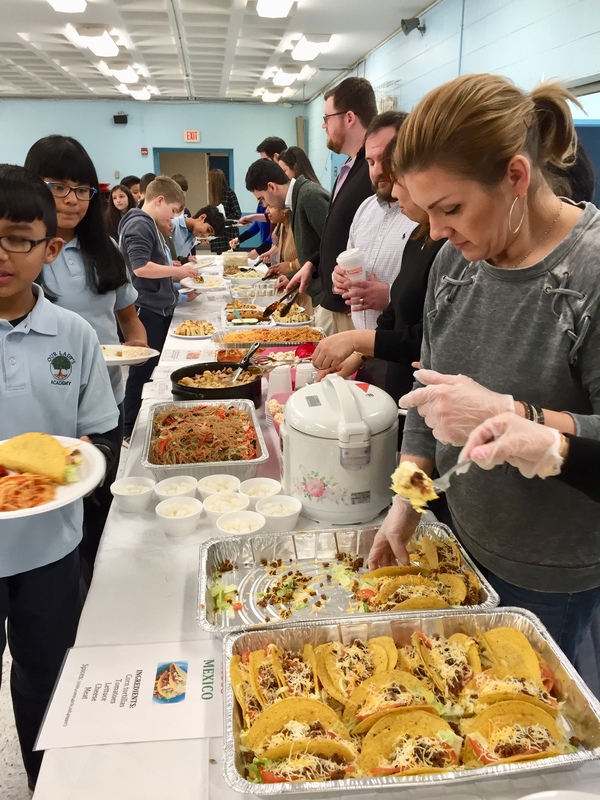 Lunch was then served by parents and teachers. 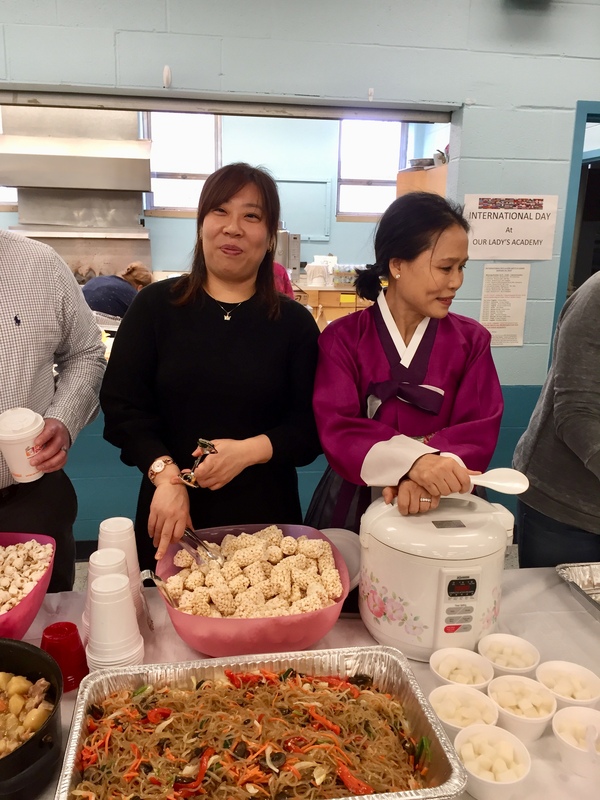 There was authentic food made by parents; fried rice was donated by Waltham's Sichuan Garden and some food was purchased at ethnic restaurants for all to sample. 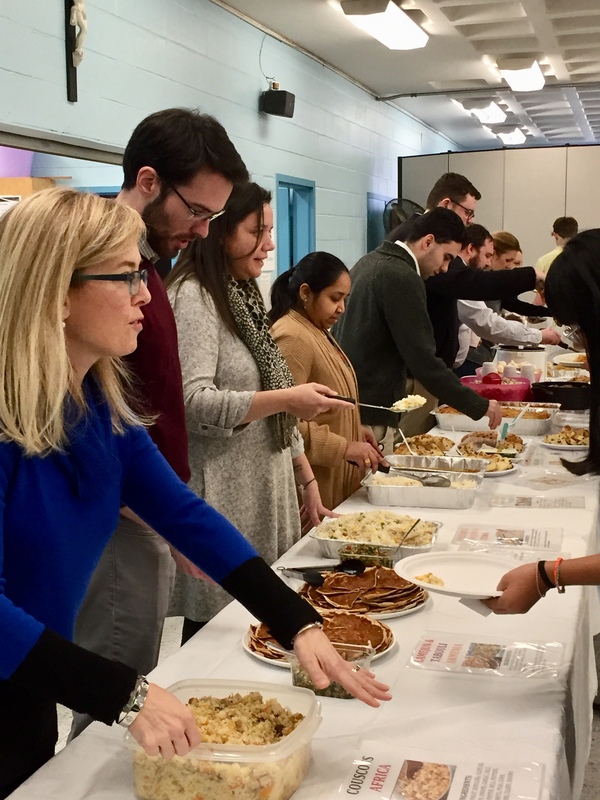 Lunch ended with good ole American apple pie and vanilla ice cream that was donated by Star Market on Lexington Street. 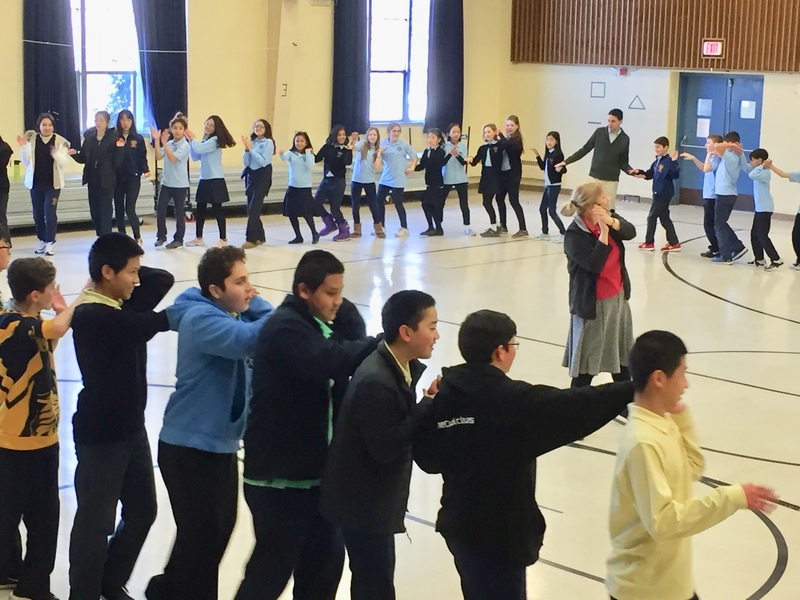 In culmination of this day long event, the students engaged in a variety of ethnic dances led by Marcy Van Cleave, a professional folk dance instructor. It was a great day! 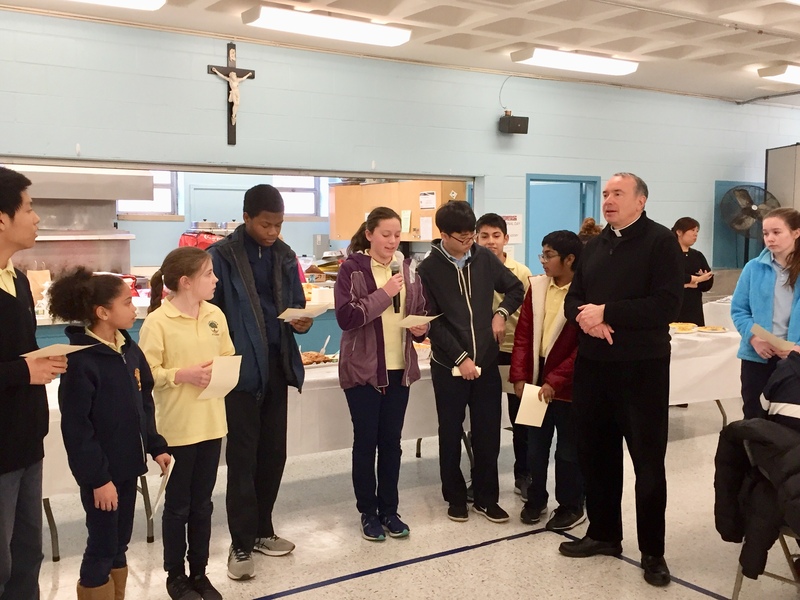 The altar servers and their families joined Fr. 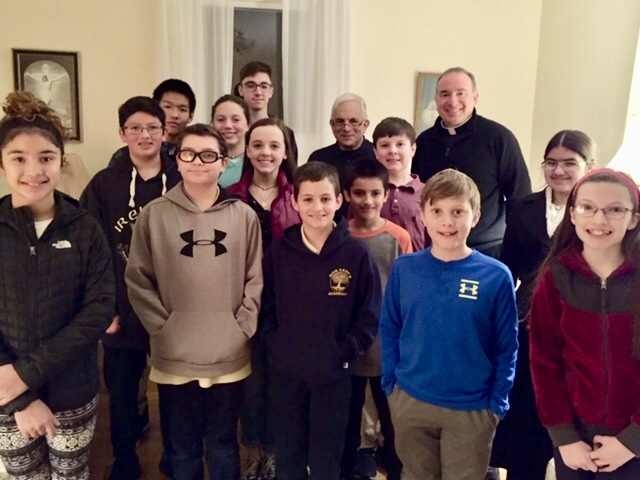 DiPerri and altar server coordinator Paul Loscocco for a pizza and ice cream dinner at the rectory on January 11. What great kids! 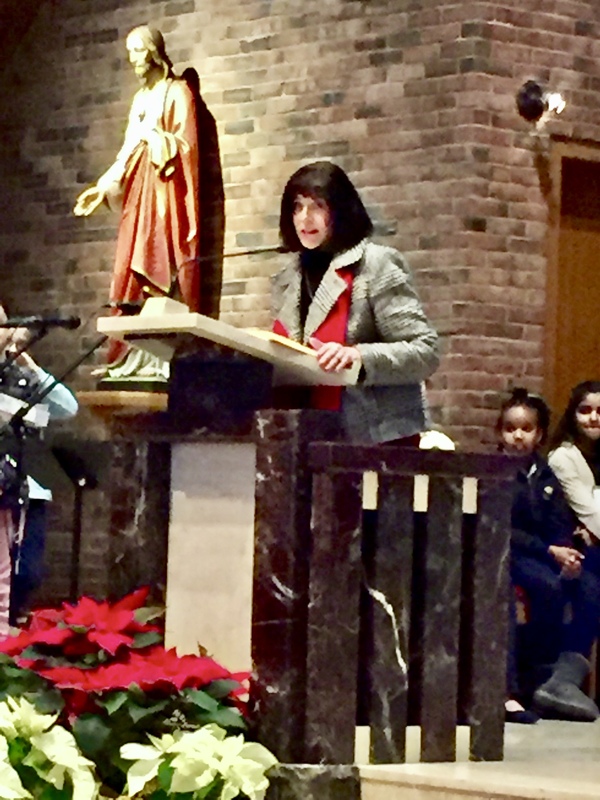 We are truly blessed to have such dedicated families in our parish. 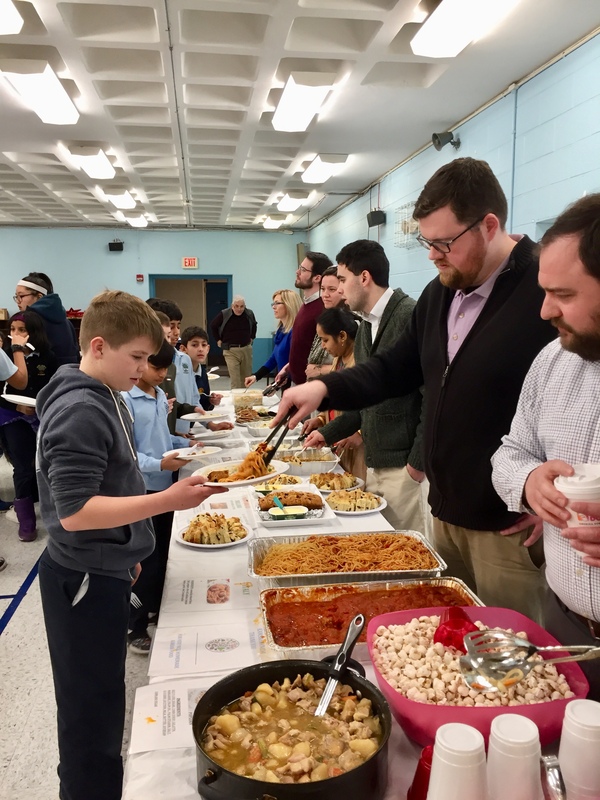 Each year, the Vocation Office of the Archdiocese of Boston invites high school age young men for an evening of prayer, food, and conversation. 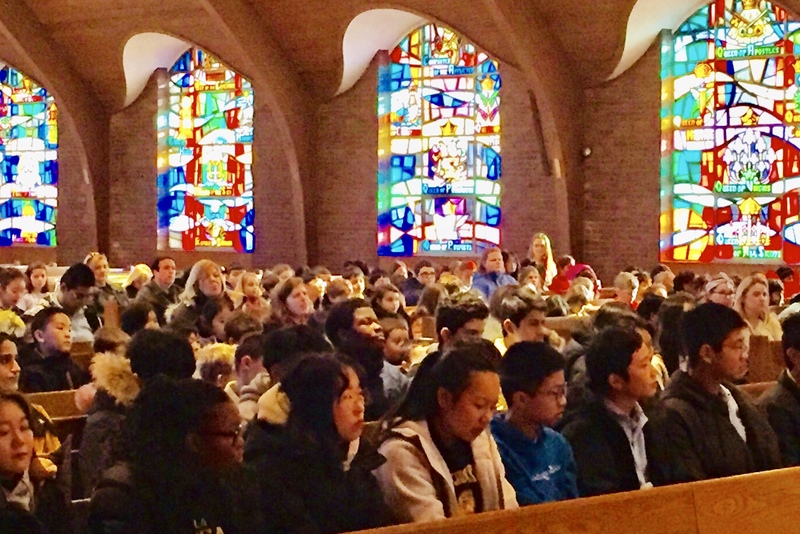 This year Our Lady’s Parish was well represented by eight high school parishioners and their families. 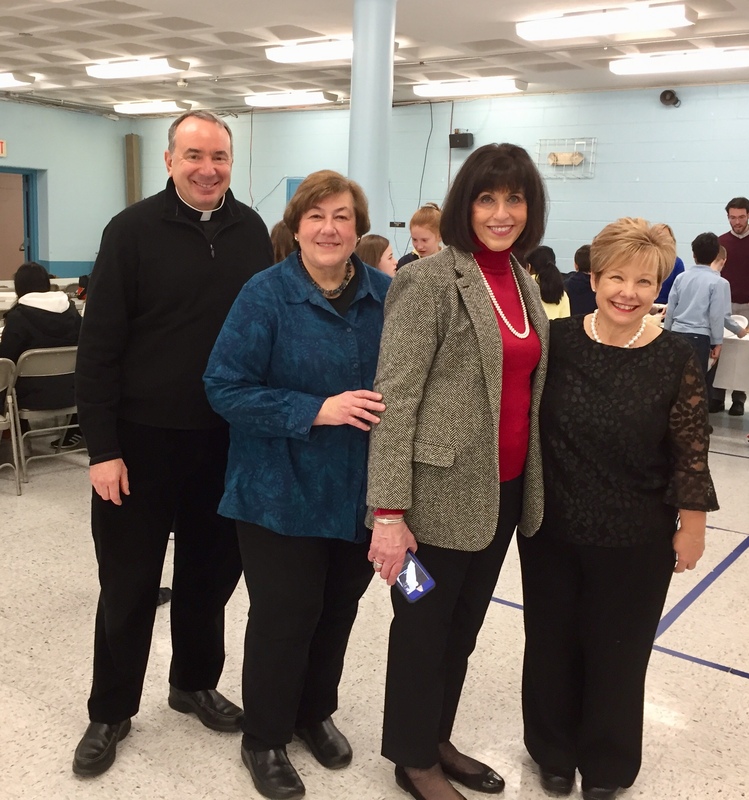 The event was held at Sacred Heart Parish in Watertown on Tuesday, November 27. 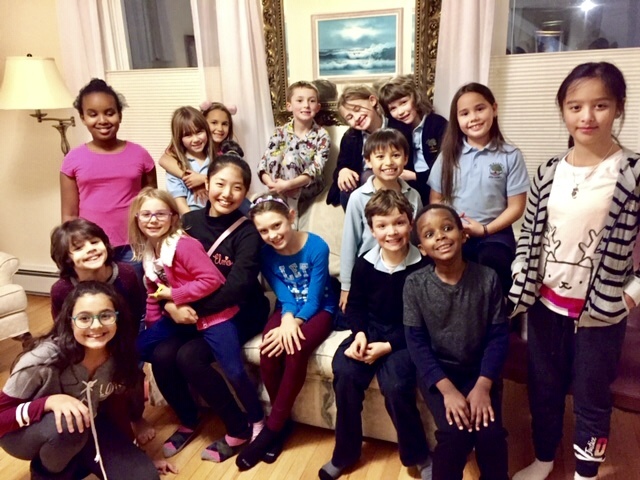 On Friday, November 30, Patrick Botti, Tom Fallon and the children's choir and their families had a pizza party at the rectory. 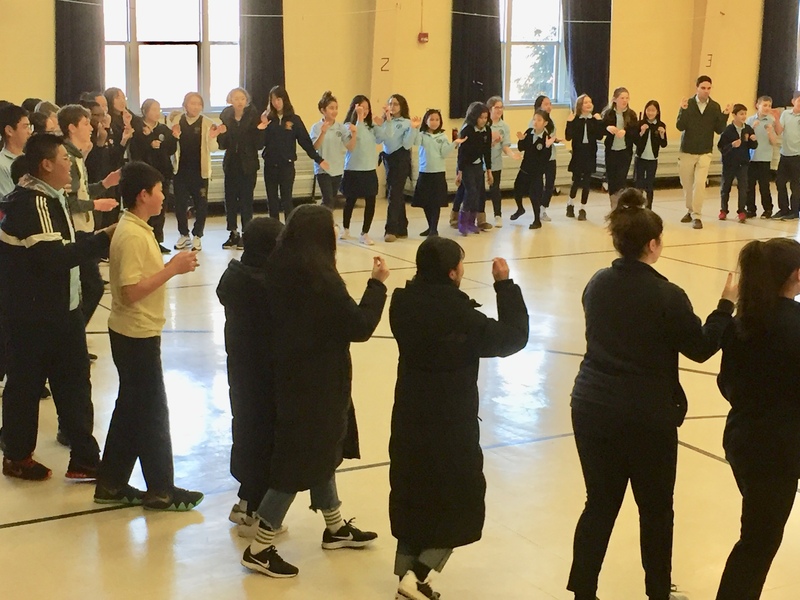 Our Lady’s Academy and Religious Education students in Grades 6, 7, & 8 will participate in an Advent Field Trip to the North End of Boston on Saturday, December 15. 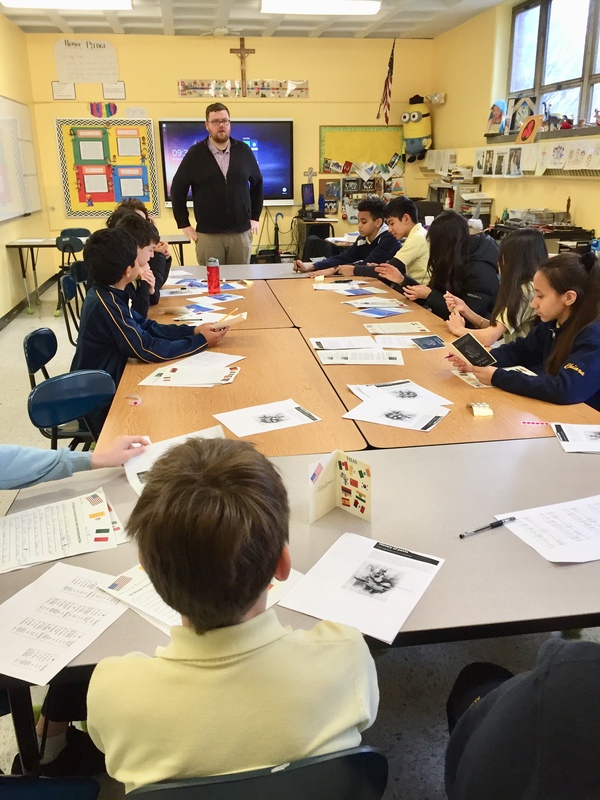 Led by Father DiPerri, who will share his immense knowledge of Boston history, we will visit the beautiful Seaport Shrine of Our Lady of Good Voyage, along with a couple of historic North End Catholic churches. Of course the group will stop for an authentic & delicious Italian lunch along the way! 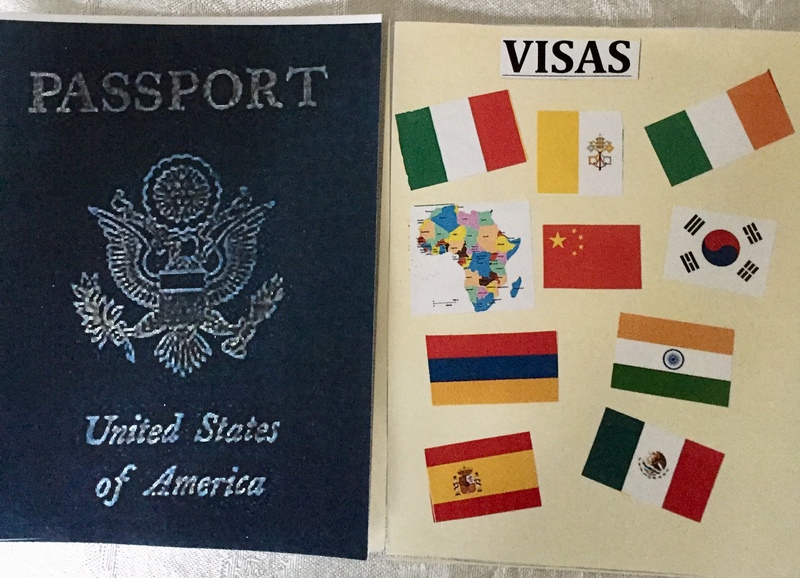 We will travel by bus, there is no cost, and parent chaperones are needed. 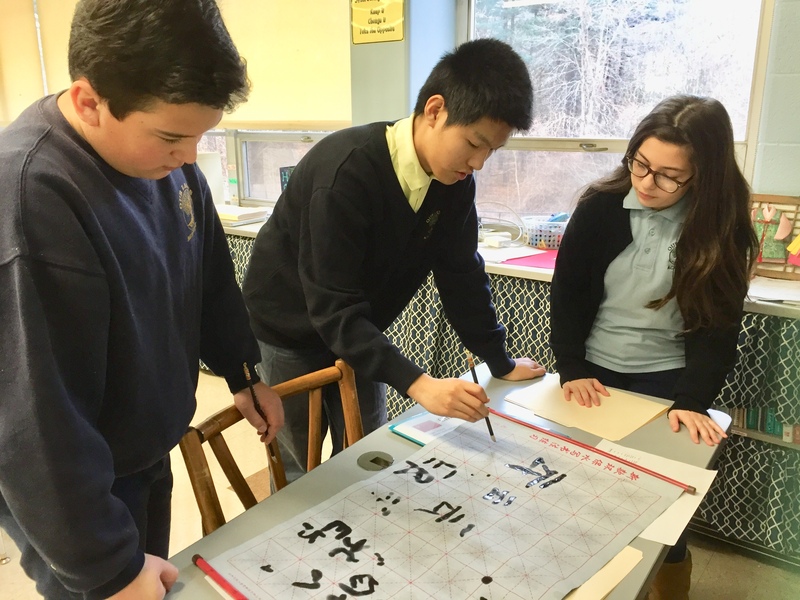 Please contact Felicia Forger at 781-894-3481 or religiouseducation@olca.org to sign-up or for more information. It will be an interesting, fun, enjoyable afternoon with friends complete with magnificent Churches and pasta perfection.